My enthusiasm for 2011 puzzle game Pushmo was borderline unprofessional. Also: nearly irrational. Pushmo was a block-pushing game and, really, the last thing the world needs is a game that doesn't just feature more block-pushing puzzles but is all about them. But Nintendo did good with Pushmo. I've long said it's the best game on the 3DS. I don't mind that it's download-only (hey, I'm a free-thinking individual!). I don't mind that it doesn't star Mario or Zelda (gasp! Nintendo doing something entirely original… new characters!… clear some space in the next Smash Bros. roster!). Now comes Crashmo, the sequel to Pushmo. The day I got a download code for this one from Nintendo, I was giddy. Clarification: I was as giddy as I get. Pushmo had more than 100 puzzles that all feature a fat little guy named Mallo who has to get to the top of structures made of push-able and pull-able blocks. That's it. And it was brilliant, because, when skilled game designers concoct such a simple, clear design, they can do great things. The puzzles were shaped as abstract objects or as more familiar things, like giant Super Mario characters. They got hard and solving them could make you feel like a geometric genius. WHY: Like its predecessor, this is a well-designed puzzle game that will give you headaches before you make the breakthroughs that make you feel like a geometric genius. Type of game: Block-pushing puzzle game—but this time the blocks can fall! A sequel to the magnificent Pushmo. What I played: Cleared 88 of the game's 100 puzzles; only used a solution found online once. Solved a batch of the bonus puzzles. The eureka moments that came from solving the hardest puzzles. The improved camera controls that make sizing up these puzzles a pleasure. The 3DS' 3D effects, which aren't stable enough for a game that requires lots of perspective changes. The slightly diminished sense of fun that infused a lot of the first game's puzzles. "Good lord, that was hard. I can't take any more. OK, let's try another." "Not the prequel to Halo, despite the similarly dumb name." Crashmo has more than 100 puzzles that all feature a fat little guy named Mallo, who had to get to top of structures made of push-able and pull-able blocks. The new twist? The blocks can now fall. This may sound like the most boring twist of all time, but it transforms the game so radically that playing Crashmo after playing Pushmo feels like going from playing soccer to basketball. In a very basic way they're the same game, but they play very, very differently. 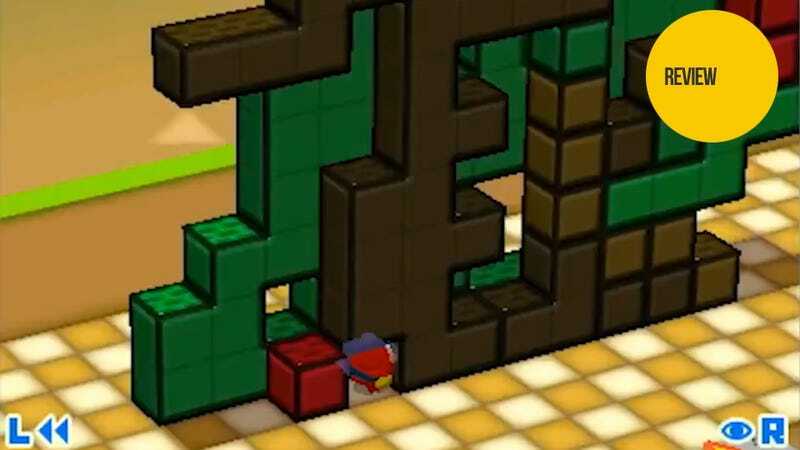 The new game's puzzles are comprised of stacks of block structures and pulling one out from the other causes the one above it to fall straight down. The physics are bizarre. You can essentially stand a table on one leg in the game. But pull that last leg out and you've either gotten closer to solving things or screwed up big-time. Crashmo turns out to be way harder than Pushmo. The puzzles in the first game could be vexing, but the worst you'd be doing was the equivalent of opening the wrong drawers in a hundred-drawer dresser. You might pull the wrong blocks and need to reset the puzzle. You'd never just cause the whole thing to collapse. Crashmo is rife with potential disasters. And it gets harder as the developers introduce blocks that float. Stupid cloud blocks. The designers of Crashmo are merciful, thankfully. Their returning mentor character Papa Blox (great name!) is back to provide tips. New minion Corin will even hop through some training levels to teach the game's more obscure moves. The original game's instant rewind feature is back, letting you undo a bad pull or reckless jump. Improved camera controls enable you to more effectively see all the sides of the puzzle. Plus, you can skip any level and try it later. All of this is useful, because the game becomes a hard chew very early on. Crashmo, like Pushmo gives players access to a level creator and, if history serves, players will soon be making and sharing amazing puzzles. That will be more welcome this time, because one of Crashmo's few disappointments is how lacking in personality its puzzle levels are. There are few winks and nods in the designs, which are mostly abstract structures and not literal collections. A hidden batch of puzzles called Prototypes has a giant dragon and a floating castle puzzle. Most of Crashmo's puzzles lack that charm. They're just towers and stacks waiting to be solved. The new game is good and very challenging. It manages to make major differences out of what essentially has been a single gameplay change. I'm not as excited about Crashmo as I was Pushmo. The shock of the new is gone. But the surprise that there's a polished new puzzle game for me to obsess over is a welcome one. If you can stand to push more blocks in a video game, you'd like this, too.